We are starting to memorize the 10 Commandments in Bible class Sunday. I always send home a copy of each week's memory work and this one seemed obvious...put them on "stone tablets". Since I've already done all the work, maybe you'd like to use them too. These files print on your standard 8.5 x 11” paper. Cut them into squares for memory work take homes, then make them into a book! When we have memorized them all, I'll print them again and have the children write a way it applies to their life as a child on the blank page. Then have them cut the tablets out. To make the book they will fold each in half on the center line, then glue stick the back of the blank side of Commandment 1 to the back of the printed side of Commandment 2 and so on. Then cut the cover out and fold on the center line. Glue to the book. Or you could trace the tablet shape a little bit larger on black construction paper and have them cut it out and glue it to on to be the covers and write "Ten Commandments" on the front with a metallic silver marker. This will help the commands be personal and memorable to them. Remember to have fun doing it! What a great project! Love it, thank you! Dear Lynette, so nice to hear from you on my blog! Thanks for your always lovely words, praise God for you! So glad to see you're still posting so much amazing stuff, wtg! Thank you so much for this post. I want to let you know that I posted a link to your blog in CBH Digital Scrapbooking Freebies, under the Page 17 post on Feb. 14, 2011. Thanks again. 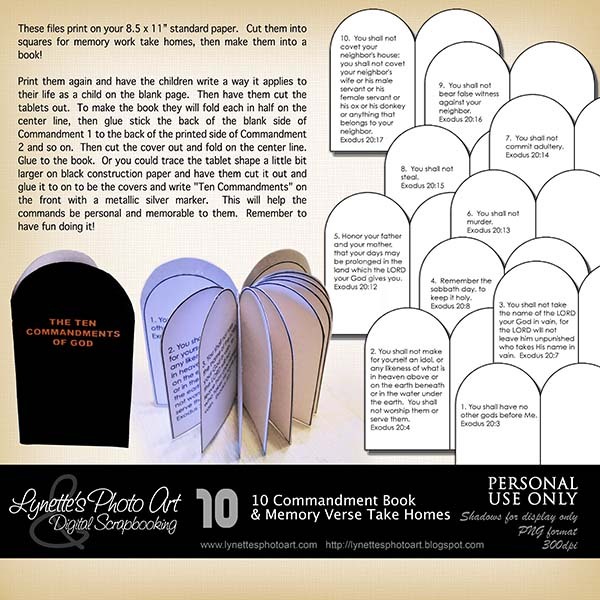 What an awesome craft to make the commandments meaningful to children. Thanks so much for posting as a freebie!